As the shock waves sink in of Britain voting to leave the European Union (EU) and reverberate around the country, the EU and the rest of the world, it looks as though not all Britons are prepared to take this decision lying down. 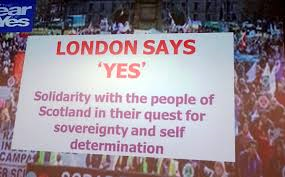 Signs are beginning to emerge that the people of Scotland and London (and possibly Northern Ireland) who all voted convincingly to remain in the EU, are seriously thinking of leaving the UK and remaining within the EU as independent states. The dire economic consequences of Brexit, which were highly predictable, has begun, with a sharp fall in the value of the pound against other currencies and the stock market is in free-fall, was simply disbelieved by the English and Welsh voters. Expert is now a dirty word it seems, and the ramifications of this could well poison other policy areas, for example, in matters relating to the science around climate change. It looks to me as though this kind of spasm from the electorate, is a general reaction of discontent with all kind of things, but because the causes are complex, it is much simpler to focus on immigration as the cause of all our ills. Problems such as falling wage levels are happening in all Western countries, including those not in the EU, like the US, but in Donald Trump like fashion, the easy answer is to build a wall to keep foreigners out, rather than address the real issues. Immigration has been the lightening rod in all of this, but if you look closely at the results of which areas voted heavily to leave the EU, they have hardly any immigrants from the EU, whereas areas that voted to remain, London and Manchester for example, do have significant numbers of EU migrants. Pandora’s box has now been opened with the decision to exit the EU, and not all of the effects are probably apparent at this time, unknown, unknowns, as it were. But we are certainly in for a bumpy ride over the next few years, economically and politically. What we do know, is that Scotland will almost certainly demand another referendum on independence from the UK. Nicola Sturgeon, Scotland’s First Minister, has said as much, and she indicated that London will have an interest in this too. Khan wants to be involved together with Nicola Sturgeon, the SNP leader, in the talks around the terms of the Brexit deal with the EU, but to stay in the single market, as he suggests, would likely entail accepting free movement of people, which is hardly going satisfy the wishes of most Leave voters. Maybe Khan is just proceeding cautiously here, because he surely knows this is unachievable given the strength of feeling surrounding immigration in most of England. There is another option though, complete independence as a city state for London, which is perfectly feasible. London’s population is equivalent to those of Scotland and Wales combined. Its economy is almost double the size of these nations together. Population wise a city state of London would be the fifth most populated in the EU and rank seventh in the GDP league table, similar to Sweden. There is no problem with London being an independent state, it is only a matter of political and popular will. On this score, within a few hours of the referendum result being announced this morning, a petition addressed to the London Mayor appeared on Change.Org entitled ‘Declare London independent from the UK and apply to join the EU.’ At the time of writing, the petition has had over 86,000 signatures. Momentum is building behind the idea of independence for London. I have signed the petition, and ask all of the Londoners who voted to remain in the EU, to do likewise. Independence for London will make Londoners more wealthy, and maybe make us feel better about ourselves too. Personally, I just don’t feel English anymore. I want a tolerant, vibrant, and diverse society, and the only realistic option open to me now, is to have this as a Londoner. In such a polarised Yes/No vote as the UK's EU referendum that was heavily loaded in terms of the conditionality of the UK's EU membership, there are broad disparities as to why people and regions voted the ways they did. Perhaps a factor in Londoners' general preference for REMAIN is that exposure to people's of varying nationalities makes us much more broad minded than those who see the world — and especially migrants and migration — through the very bigoted lenses of The Sun, The Daily Mail, and The Daily Express without ever getting to interact with such people as people. Having lived in different regions of England, I know that there are several people whose world view is largely formed by the prejudices peddled in such rags rather than by first hand experience. And as someone has said, "Not everyone who would vote for Brexit is racist, but racists would certainly vote for Brexit." The depth of UK poverty are disgusting to human decency and compassion. and the impact of a global housing market and laundered money on non-homeowner Londoners deepens the socio-economic divisions in London. I wonder: given the way that the IMF and other financial institutions have trampled on democracy in Poland, post-apartheid South Africa, etc, might not the UK's EU referendum results turn out to be part of a conspiracy furthering what Naomi Klein has called 'disaster capitalism' in her book 'The Shock Doctrine'? Dear Bernie, Don’t Give Up, Run as a Green!